Recently President Brian asked me to prepare an article for our website about my Triton Race bike – so here goes. I started racing fairly late in life - mid thirties, mostly due to family commitments. 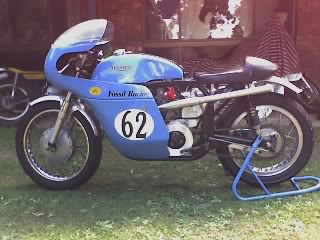 At first I rode in regularity events on my trusty old 500 AJS but soon wanted to compete in actual race events. I had a lot of fun but not much success due partly to lack of horsepower, poor brakes and very little skill. Following assistance from Rob Olsen, Geoff Howie and Mike Farrell, the AJS became more competitive and I was able to run mid field. By then I had realized however that I was never going to be a Mick Doohan and decided to look for a better bike which hopefully would compensate for my lack of talent. Bruce Russell who had been helping me prepare the AJS decided he would like to compete and so the old Ajay was given a new lease of life. However that’s another story and since I don’t want to steal Bruce’s thunder, I’ll leave the telling of that to him, in a future article. I purchased a Norton Slim Line rolling chassis from Col Rowe and set about building the Triton with go and show goodies imported from England. I stumbled onto a 650 cast iron Triumph engine, which was set up for methanol, fitted with a Nourish crank and through bolted, at a Phillip Island race meeting and slotted it into the Norton frame. At last I had a Triton. The bike was quite competitive and we had a lot of fun and achieved the odd placing on it. Unfortunately like most over stressed engines, it eventually disintegrated. With no budget to develop another competitive engine, we put together a 750 engine which turned out to be OK. During all this time I had also developed a passion for side car racing and realized that I was more competitive as a three wheel racer. Since Bruce and I had been sharing rides on the now 750 Triton at various events including the Leyburn Sprints, with Bruce achieving far better results than me, we decided that he campaign the solo and I would stick to something safe like side car racing. I had been collecting parts including a set of Routt 810 barrels, for some time with a view to building a BIG engine for the side car. Following a spectacular off-track excursion on my outfit at Stanthorpe a couple of years ago, which left both me and the side car temporarily disabled (read stuffed), we decided to give the Triton a complete bare frame rebuild and donate the BIG engine to the project.